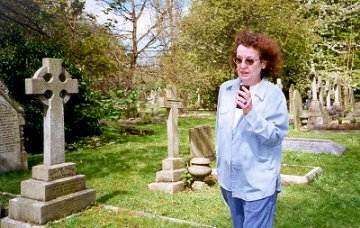 At certain times of the year, a 5′ 3″ woman with dark, curly hair can be seen pacing round a graveyard in West London speaking into a dictaphone, gesticulating occasionally and stopping from time to time — to peer at the gravestones. This rather unorthodox method of composition first started when Ruth contracted Repetitive Strain Injury 11 years ago and could not use her word-processor. Just a few weeks away from the deadline on her next book, she fell back on the dictaphone. By nature a fiddler and a pacer, she decided to walk while dictating. The graveyard is just a few minutes from her house, an inspiring location for a crime writer but not the place to attract many other amblers (occasionally she does, however, get some strange looks from those visiting graves). 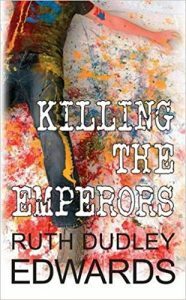 Ruth tends to write her books in a flurry of 12-hour working days. She thinks about the theme and some of the characters at her leisure in advance, decides who will be murdered and where and then plunges in, letting the characters and the plot go their own way. Several of her main characters, including Jim Milton, Ellis Pooley and the cat Plutarch started as walk-on parts. Jack Troutbeck, who was supposed to have a cameo role, seized centre-stage and has hogged it ever since. Final deadlines have fallen at different times of the year – and Ruth prefers it when they come in the summer. Graveyard walks tend to be speedier affairs when it is cold, raining or even snowing. 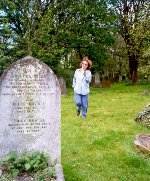 The graveyard is not just the physical location for her first drafts, either; it also inspires some of the characters. Many names in the novels have come straight off the stones. She already has a small stock of names ready for possible use in her next book Carnage on the Committee — Gladys Cagney and Maud Thick being two current favourites. 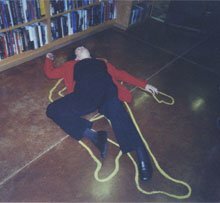 Ruth at Poisoned Pen Bookshop in Arizona, run by her editor, Barbara Peters, who is married to her publisher at Poisoned Pen, Rob Rosenwald.